Our nationwide plant hire fleet includes modern equipment from 1 ton mini diggers up to a 50 ton excavators, specialist machines include long reach dredging excavators, and high reach demolition machines, dump trucks with floatation tyres, dozers & excavators with GPS control and Loading Shovels in waste & quarry spec. All machines are available to hire for short term hire or long term contract hire along with many attachments. A wide range of good quality used plant for sale from top brands including Komatsu, JCB and Daewoo. All our used plant machinery has been owned by us from new and comes fully serviced with a warranty. 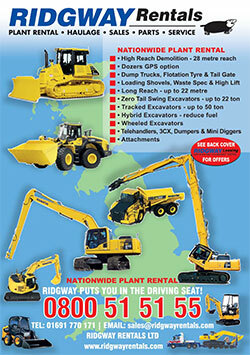 Take the risk out of buying used and come to Ridgway Rentals for the best price on used plant machinery. Flexible payment terms available. Plant can be supplied at a discounted rate on long term contract hire. PLUS – we understand that plans can change – arranging plant contract hire with Ridgway offers you complete flexibility! Plant can be off hired or exchanged for a different machine to suit your requirements. Our haulage fleet includes a number of different sized HGV’s and trailers to ensure plant machinery is moved legally and economically. They range from a 3 ton truck up to an 80 ton articulated HGV and are all operated by experienced and compliant drivers. We can deliver to and from anywhere in the UK at competitive rates. Our Nationwide Plant Hire delivery is charged at a local rate which ensures we offer very competitive hire rates all over the UK. Parts and servicing for all makes and models of plant machinery including hydraulic hoses made on site. We also have fully equipped service vehicles to enable us to offer on-site repairs, maintenance and servicing.